Sellers must understand what drives their customers and their core needs in order to help them be more effective, and conducting high-quality customer interviews is an important piece in that process. Hannah Shamji is a conversion copywriter who has a degree in Psychology and training in counseling. She likes to merge her understanding of human behavior through customer research with producing an effective customer interview. It brings about accurate feedback and insight and provides a valuable asset to your business. 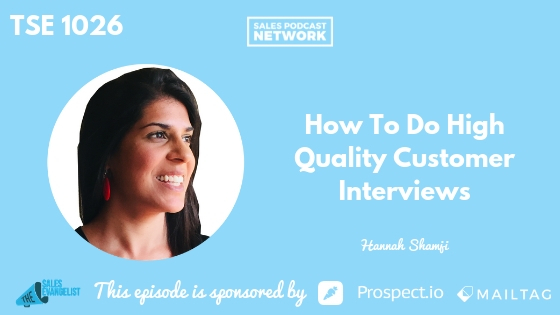 Focus groups are a popular way of conducting interviews, but Hannah has found them to be time-consuming and not very effective in getting pure, unbiased answers. When we ask the wrong questions, we often get empty answers. There are time constraints in creating the right questions to ask. There is a difference in just writing a question and coming up with a question that sparks the emotions of the customer to draw out the purity of their response. Speak to the emotional drivers of your audience. This helps bridge the gap between what you think might sell your product or service and what will actually sell it. Doing these customer interviews correctly will help you answer the questions of what you should sell, how you should position it, what people care about, and what features or aspects you should focus on. In the past, I’ve done things just because they seemed like a good idea rather than being sensitive to whether it was something people wanted. An example of this was for a college class, my classmates and I had the opportunity to create an on-campus business. What created excitement for us ended up being a complete failure, and ours was one of the first companies in the school’s history to lose that amount of money. We were more concerned with our own interests rather than what the rest of the student body was concerned with. This is why it is so imperative to find out the products and services that appeal to your audience. Find your target audience and connect. 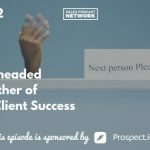 This audience could be an existing customer you’ll propose something different to or a prospect you aren’t sure will be a good fit. Figure out the target market and pursue it. When Donald first started out in the business industry, he worked for several small companies that did not have a target audience and they just wanted him to go out and sell. The mentality of not having a specific audience to market to is not a good sales strategy. Once you establish who you want to market to, the kinds of questions you ask are imperative. Avoid asking “why” questions. Research shows that when people are asked “why,” they feel like they have to justify or validate their answer, which can lead to defensive answers that may or may not be accurate. Instead, ask the customer questions directly relating to the product or service. Ask questions to understand the customer better. This can shed light on how the customer can benefit by investing in what you have to offer. Define an anchor. What do you want to accomplish or gain from this conversation? Follow the leads. Ask things that correspond to what the customer is discussing and try to bring about different responses to the same topic. Don’t be afraid to go deeper with responses. Listen for hints about what motivates your customer: why is he interested? Why was he willing to make the investment in your product or service? What sets you apart from competitors? Avoid pitching your product or service. This keeps the customer feelings unbiased and honest. Use these conversations as pure research to better your business. Unbiased customer answers can lead to a successful, productive and efficiently-run business. You can reach Hannah Shamji through her website at www.hannahshamji.com. She provides a guide with do’s and don’ts for customer interviews on her website. 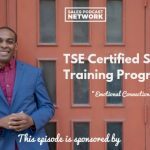 This episode is brought to you in part by our TSE Certified Sales Training Program which teaches you to improve your sales skills, find more customers, build stronger value, and close more deals.